I am not a person who believes there is a right way and a wrong way to do domestic chores, but I do have a certain way I like to have the bed sheets folded. "My way" serves two purposes. 1) It gives the linen closet a neater appearance, and 2) It keeps me from misplacing a piece of a set. I used to fold each piece and stack them separately. Sometimes a piece would fall or slide off into another pile, and it just didn't look nice, either. That darn fitted sheet always looked so funky! Believe it or not, a MAN showed me this method. Granted, he learned it from his mother-in-law and he had three young daughters, but still, a man who cared about folding laundry? Alas, he was only a friend! On with the folding. It's not rocket science, but it works for me! 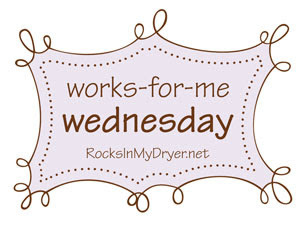 Check out Works for Me Wednesday (sponsored by Rocksinmydryer.net) for other tips and tricks on a variety of topics! I'm not so particular about my sheets, but I am about my towels and have had to teach my girls to do it MY WAY! let's see if I can explain our way of folding those dreaded fitted sheets. all four corners in one until you have them tucked into each other (already not explaining it right...lol) then you have one neat rectangle, fold as normal. what a Great Idea! anything that makes things look neat is a fav. 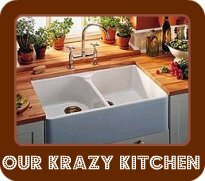 of mine (neat freak)!! I have to check out the works for me wed. site. I fold them nice, and then someone goes into the linen closet and disaster hits, without any explanation....wait that is called having kids. That's a great way to get the kids to help too. Thanks for sharing. Very, Very, Very Good idea! Thanks for sharing. Not so hard to do either. You should call Martha Stewart, she'd want to know about this one. I do this too and I love the way the closet stays organized (or at least somewhat) and when I need to change sheets I just grab and go and I know that the whole set is together! Great suggestion. My kids normally do the folding, so I'm happy with folded and put away, however it looks. But my husband is a bit of a fanatic about having the towels folded HIS way. I had to learn it when we got married. Until then, I'm not that fussed in the way the sheets are folded but I am particular about the towels and DH and the kids have had to learn to do it "my way". The shelves in my linen closet are not very deep, so I always wind up with leaning towers of sheets. This is a great solution! Also, thanks for stopping by my blog yesterday! Great idea--my linen closet looks like a tornado blew through! Thanks for sharing this: I've never been happy about folding fitted sheets. This way, I don't have to look at it after I've folded it! Looks great! 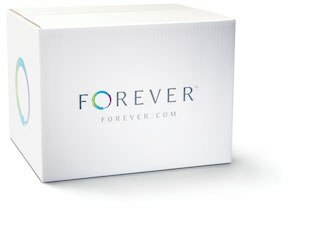 I'll try it even though my linens are in containers undre the bed (no linen closet) Have a nice weekend!